Glenfield Empty Bowls Project provided the community with a dash of compassion, a pinch of service and handmade bowls full of soup. 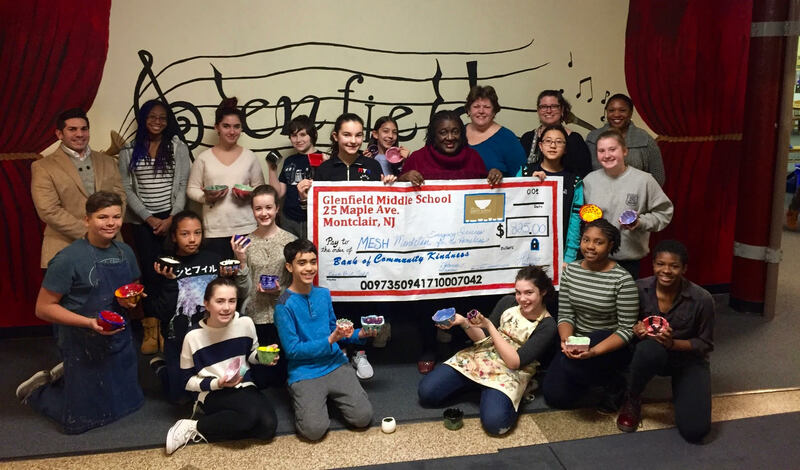 Empty Bowls Project helped the entire Montclair community. Photo courtesy of Montclair Fund for Educational Excellence. Glenfield Middle School filled hearts and stomachs on Fri. Mar. 10. The Empty Bowls Project served up bowls of soup to the Montclair community as a community service effort. Visual Art teacher Deb Comeau and Culinary Skills teacher Shelley Stebbins wrote the grant in fall 2016. The Montclair Fund for Educational Excellence assisted with the funds for Empty Bowls community service project. Comeau and Stebbins donated the funds from the project to Montclair Emergency Services for the Homeless. Dr. Ames from MESH visited Glenfield Middle a week before the event, so students could understand how the funds they were raising were being used. Some Glenfield students were already familiar with MESH through church or synagogue dinners. MESH aims to address issues of homelessness in and around Montclair. Over the past several months, Ms. Comeau’s visual art students worked hard to construct ceramic soup bowls. Comeau guided the students. Each soup bowl came out unique as students worked over the course of several classes. At the same time, Ms. Stebbins was helping her seventh and eighth grade culinary students prepare three different kinds of soup for patrons to enjoy in their beautiful handmade bowls. “My group and I made spaghetti and meatball soup. We worked on it for about two hours and throughout those two hours I learned with spices to add and how to saute onions. To top it off, I got to eat some with my friends, and it was very delicious,” said Isabella Martling, eighth grade student. The Empty Bowls event happened on Feb. 2, with parents, teachers, students and community members in attendance. Patrons selected a bowl to fill with the simmering soup of their choice. They slurped ladle after ladle of chicken noodle, vegetable and spaghetti and meatball soup. There was even a gluten-free option. Patrons took their handmade bowl home with them after eating to their stomach’s content. The Glenfield Middle students created a clean-up station so patrons could clean and wrap their bowls for transport home. Stebbins, Comeau and the Empty Bowls student team presented the donation check to Dr. Ames and MESH on March 10. Students who made bowls and/or soup were present at the check presentation. “I enjoyed the project because I was able to help people by doing something fun,” added Olivia Williams, another Glenfield eighth grade student.